We refer the savviest dog walkers in San Luis Obispo County! 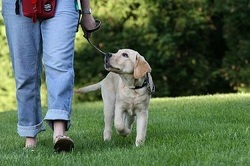 Does your dog need a walk or potty break while you're at work or out of town? Do you have a dog with a lot of energy? Let us help! Regular walks help release energy, build cardio, encourage calm, and build muscle strength. We will carefully assesses each dog's needs, ability level, walking style and energy level to customize each walk. Are reliable, patient, and give your dog lots of love! "Our dogs are so much happier and less anxious on the days Savvy Sitters takes them for a walk."